The successful structure of the previous edition of Principles of Fermentation Technology has been retained in this third edition, which covers the key component parts of a fermentation process including growth kinetics, strain isolation and improvement, inocula development, fermentation media, fermenter design and operation, product recovery, and the environmental impact of processes. This accurate and accessible third edition recognizes the increased importance of animal cell culture, the impact of the post-genomics era on applied science and the huge contribution that heterologous protein production now makes to the success of the pharmaceutical industry. This title is ideally suited for both newcomers to the industry and established workers as it provides essential and fundamental information on fermentation in a methodical, logical fashion. 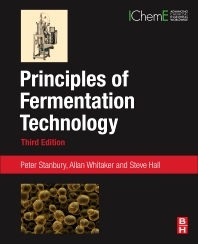 Stanbury, Whitaker and Hall have integrated the biological and engineering aspects of fermentation to make the content accessible to members of both disciplines with a focus on the practical application of theory. This text collates all the fermentation fundamentals into one concise reference, making it a valuable resource for fermentation scientists, as well as those studying in the field. Peter’s career as Principal Lecturer at the University of Hertfordshire encompassed teaching and research in microbial physiology and fermentation technology. He spent sabbatical periods at ICI Fermentation Products, the Warren Spring Laboratory and in the laboratory of Professor Ayaaki Ishizaki, Kyushu University, Japan. He also held managerial responsibilities as Head of Biochemistry and Microbiology, and as Associate Head of the School of Life Sciences. Peter is now retired but returns as a Visiting Lecturer in the field. He is a member of the Microbiology Society and was previously Treasurer of the Society and Convener of the Fermentation Group. Prior to joining the University of Hertfordshire, Allan was a research scientist with ICI working on aspects of fungal physiology and plant tissue culture. His career as Senior Lecturer at the University of Hertfordshire encompassed teaching in microbiology and research in microbial physiology and fermentation technology. Allan retired from the University and continued as a Visiting Lecturer but also combined his interest in local history and microbiology in his research on the history of the brewing industry in Hertfordshire. Allan has taken an advisory role in the development of this edition but the influence he had on the previous two editions very much remains. He is a member of the Microbiology Society and was previously convener of its Teaching Group. Stephen’s career as Senior Lecturer at the University of Hertfordshire has encompassed teaching in numerous fields across the Chemical, Biological and Environmental Sciences together with research in effluent treatment, microbial physiology and fermentation technology. He is a member of the Society of Chemistry and Industry, and a Fellow of the Higher Education Academy.